Tuesday on the YarnThing Podcast with Marly Bird: Indian Lake Artisans Hexagonal Needles! Pam and Mark, owners and founders of Indian Lake Artisans, join Marly to talk about their hexagonal knitting needles, the new one to come out, and much more! Listen in below to hear all about it! Pam is a lifelong artist and always valued quality tools. She and her husband, Mark, came up with the idea to make a new shape other than round and the hexagonal needle was born! The hexagonal shape is really great because it is easier on your hands than standard needles and the shape and the wood help the yarn stay on the needles. Their original straight needles are still being made and still have the cutest nature themed copper ends. (Julie’s favorite is the owl on the size 7). In the beginning, their smallest size was a US 10 (6 mm) because their equipment just couldn’t go smaller. Since then, they have improved their equipment with sharper blades and can now go down to a size 3 with walnut and cheery wood needles and, just coming out how, size 2 in maple! In addition to the straight needles, Pam and Mark also make double points and circular needles, cable needles, shawl pins (which also have the nature themed tops), and their own design of yarn bowls. Most of the needles, as mentioned, come in your choice of three woods (walnut, cheery, and maple) and come in different needle lengths. (Marly really likes the longer needle barrels on the circulars as they feel good in her hands). Pam and Mark are also totally willing to do custom orders and usually don’t charge any extra as they hand make everything. They are wonderful people and make an exceptional product they guarantee will last, check out their website IndianLakeArtisans.com to see all their awesome products! And we can’t forget the Giveaway today! Leave a comment on this entry with Pam and Mark’s keyword for your chance to win a set of their double point needles in your choice of wood and size! These hexagonal needles would be the kindness that our knitting hands need and would appreciate! Oops. Sock it to me. I goofed. 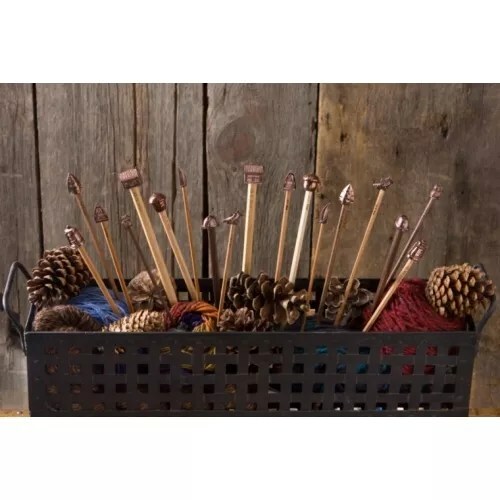 I love trying new knitting needles and these hexagonal wooden needles sound delightful. I hope good luck will sock it to me and make me a winner. I love knitting socks. I love wood needles. Your hexagonal needles sound perfect. I would love to give them a try. Sock it to me! This maybe dating me but I had to laugh. Wasn’t that what they always said on the old show Laugh In? Sock it to me! Loved the show. Those needles would really sock it to me! They’re beautiful! Socks are a fave of mine to knit, so I would love the sock it to me needles. The hexagonal shape sounds intriguing. I enjoyed listening to the explanations of the shape and why it works. Sock it to me, what a Fanastic idea, hexagonal needles would love to explore knitting again with a pair of these!! I would love to try the hexagonal shaped needles!! So sock it to me. Thanks for the great podcast and great interviews. I really enjoy your podcast Marley. I hope you sock it to me with many more episodes. I am excited to try some of these amazing needles. I really like the focuse on making their products in the us and in their local region. They also look really pretty. I would love to try your sock it to me hexagonal shaped sock needles. I think it’s great that you are sourcing your products through the United States. I just started listening to your show and I really really like it. Great interviews and information like these beautiful needles. Since I just started knitting socks, I will love to try your sock it to me hexagonal needles. I’m so glad that there are books available to eliminate my least favorite part of knitting – sewing pieces together. This book is a kindness to us knitters who can now love knitting even more. Thank you! I’m looking forward to trying the interchangeable needles when they’re available. I am of the right age that sock it to me made me giggle and so I had to explane it to the youngsters in the office. Ah well, guess that is the fickle finger of fate. Can’t wait to try these needles. Thanks for the great interview. Far out needles! They are way groovy and would love to try them. Sock it to me! Oh yes sock it to me! I have been admiring these needles for a long time and loved hearing Pam and Mark on your show for a second time. I so wish I could have called in live! Sock it to me, was such a fun catch phrase in the comedy Laugh In. I will be laughing and smiling ear to ear if I win a set of hexagonal sock needles! Knock me down (or should I say, sock it to me, Marly! I was amazed by this show as I live just down the road from them and never knew about their products!! Can’t wait to try their hexagonal needles and hope to meet them as they sound like such fun people! Sock it to me! Glad to see a michigan business, going to check out the web site right away. Sock it to me! I’d love to try these needles. I just looked at the website, I’m curious about the circular needles, and the cable and it’s flexibility. I hope I win, I’ve been into socks lately!! Sock it to me. I really want to try these needles. Pam and Mark sounded like great people! I remember how much fun that show was when they often said Sock it to me! Now instead of thinking about TV, I think about who could knit me socks and I could use that phrase to encourage him/her to knit socks for me. Hey, I would knit a lace shawl in return. I have never heard of your needles before and I would love to try them! Hmm, maybe double points and I could try to knit my own socks. Sock it to me! I am actually making socks now, and I keep accidentally pulling the stitches off. I would love to try out the hexagonal needles so that wouldn’t happen anymore! I looked on the website and everything is so beautiful. Thanks for the interesting interview! This podcast was fascinating! I love the idea of a different shape knitting needle, especially if it helps my arthritis. Sock it to me a new set. That would be wonderful. I bought one circular interchangeable needle and bow i want the whole set. They are comfortable, the project does not fall off the needles and the cords do not unscrew. I love these. Found them in Tacoma, Washington at Madrona. A little pricey but worth every penny.